Find artworks, auction results, sale prices and pictures of Cornelis Bol at auctions worldwide. Venus in the Forge of Vulcan. 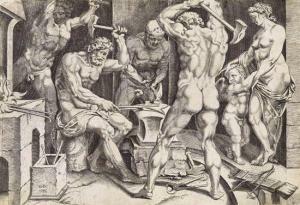 Engraving, 1546. 258x380 mm; 10 1/4x15 inches. With thread margins or trimmed on the plate mark. A good, strong impression. With--GIULIO BONASONE (after Raphael). 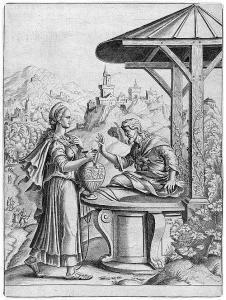 Joseph's Cup Discovered in Benjamin's Sack, engraving, circa 1543. 130x237 mm; 5 1/4x9 1/2 inches, thread margins. Bartsch 64 and 6. Mis: 64 by 109 cm., 25¼ by 43 in. This magnificent painting is a rare topographical view of London before the Great Fire in 1666. From the right of the composition the principal building is Old Somerset House. The building of this palace was begun by Edward Seymour, Duke of Somerset, but he was executed before it was completed. The ownership passed to the crown and it was used as a royal residence by Elizabeth I, and subsequently as the residence of Anne of Denmark, Henrietta Maria and Catherine of Braganza. To the left of Old Somerset House is the Savoy Chapel, the four towers of Old Northumberland House which stood at the junction of Whitehall and Northumberland Avenue, and Westminster Abbey, without the western towers which were added in the eighteenth century. Little is known about Cornelis Bol. 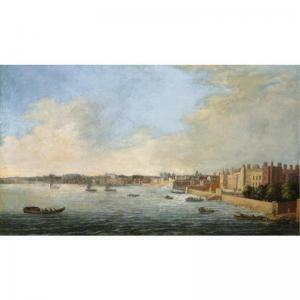 He is likely to have arrived in London circa 1635 and Vertue records him as having painted for the diarist, John Evelyn, in the 1660s "three views of London from the River side Arundel house Somersett house Towner lond. painted before the fire of London. by Cornelius Boll. a good free Taste" (Vertue, IV.53). The present picture is a slight variant on the composition of one of these three paintings (exhibited Royal Academy, Age of Charles II, 1960/61, no.224). An autograph version of the painting is also at the Dulwich Picture Gallery, London. John Chetwynd-Talbot, 21st Earl of of Shrewsbury and Waterford. Bath, Assembly Rooms, International Art Treasures, 1973, p. 2, no. 8, pl. 51. The pool of London spans the widest reach of the Thames around which the Romans first founded the city circa 33 AD, and is now divided into an Upper and Lower Pool by Tower Bridge. 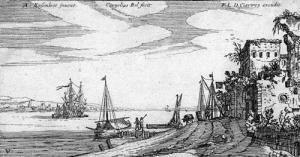 For centuries it formed the centre of maritime trade and commerce to and from London. This picture is a rare view showing the Pool before the riverscape was dramatically altered by the Great Fire of London in 1666. To the left can be seen the Church of St. Saviour's, now Southwark Cathedral, and Old London Bridge. The Tower of London can be seen to the right, with a diverse range of English and Dutch shipping on the Thames. Cornelis Bol, born around 1589, was from a family of painters originating in Mechelen, who later settled in Antwerp. Bol was active as an artist in London, and he and his wife were members of the Dutch Church in London in 1636. 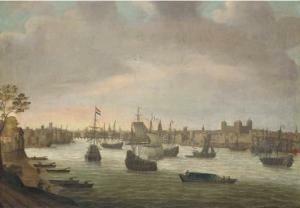 The present work is similar to a view of the Thames also showing the Tower of London by Bol recorded in the collection of the diarist John Evelyn, and probably commissioned around 1660 along with two other Thames views of Arundel House and Somerset House (see Walpole Society, 'Vertue Note Books', vol.IV, p.53). The Evelyn version was exhibited at the Victoria and Albert Museum in 1953-54, and in 1960-61 at the Royal Academy Exhibition of The Age of Charles II, no.830. Another version is at the Dulwich Picture Gallery, signed 'C.B. '.